Unmonumental is simultaneously the name of a book, a pioneering exhibition at the New Museum’s new home in the Bowery for which it functions as catalog, and a school of sculpture that the book argues is the leading edge of art right now. According to comments by Utah artists whose own aesthetic impulses, not surprisingly, are nothing like what’s on display in this book, “unmonumental” is an idea we will all need to become acquainted with. Whether or not you liked Cubism in 1912, Dada in 1922, or Surrealism in 1932, their influence on art everywhere made at least a passing acquaintance with them essential credentials for anyone seriously interested in contemporary culture. Comprehending Unmonumentalism is likely to prove equally indispensable to us today. Unmonumental, with essays that by turn demonstrate its principles and offer unusually lucid explanations of them, could be the essential introduction for those wishing to understand what this seismic shift in modern art is all about. One thing that immediately stands out about unmonumental art is its unapologetic reference to the real world—the world outside art. According to the preface by Lisa Phillips, the arguably decrepit and less-than-substantial appearance of unmonumental art means to capture “the extreme delicacy and fragility of life in the twenty-first century.” Never mind that “delicacy” sounds the wrong note for an historical era that has set records for brutality. More important than how these critics characterize our moment, even as we live it, is the way their subject artists’ repudiation of formalism is becoming, in unmonumentalism and elsewhere, a worldwide trend in art. In an essay titled Ask the Dust, Massimiliano Gioni traces this search for both real life relevance and artistic legitimacy. “Traditionally, sculpture has been the territory where permanence is celebrated,” he writes, connecting both meanings of “monumental.” But moving from St. Petersburg to Paris to Baghdad, he finds that a “founding image of this short century is that of a sculpture being dragged down from its plinth.” Pursuing permanence and monumentality back to the shift that saw statues become sculptures a century ago, he recalls how Modernism flirted with putting an end to sculpture’s antique role of permanent image, but ended by replacing monuments with secular objects “based on the same values of unity, integrity and solidity that pervaded the language of commemorative sculpture.” How sculpture sought a new groove beyond durable portraits, and whether it has finally found it, is the drama that threads through Unmonumental. 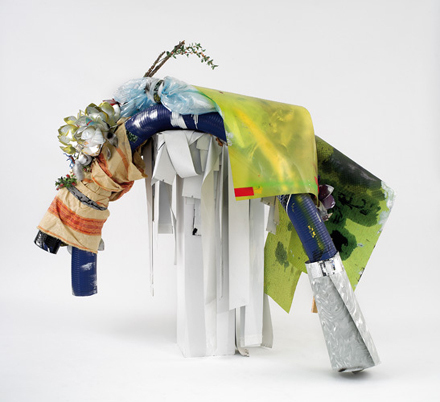 The heart of Unmonumental is Laura Hoptman’s essay by the same name, crediting the leading position of sculpture in today’s art to the application of assemblage strategies to unmonumentality, which she describes as a reaction to, and a step beyond, the Combines of Robert Rauschenberg. Her argument thus takes on a measure of poignancy, the unmonumental coming along as probably the most prolific and arguably the most influential American artist of all time is passing (and since this essay was written, has passed) from the scene. 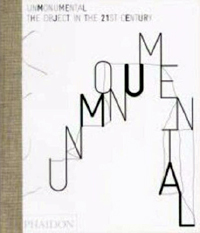 The concepts tackled by the authors of Unmonumental are challenging, but curators Gioni, Hoptman, and Richard Flood, accompanied by essays from Trevor Smith and Benjamin Godsill, biographies of thirty of today’s leading sculptors by Sara Reisman, and rounded off with a glossary of key ideas by Eva Diaz, perform prodigious feats in rendering them accessible. Full and half page color illustrations of all the artists show the wide range of their individual approaches to a way of sculpting that has not produced a homogenous look, while the separate essays are illustrated by key historical examples. If this were likely to prove a sideshow in recent art it would still be a gorgeous book. But with Unmonumentalism increasingly looking like the biggest thing in American art in over 40 years, what’s in this book is likely to prove essential. And it’s not likely ever again to be so conveniently packaged.